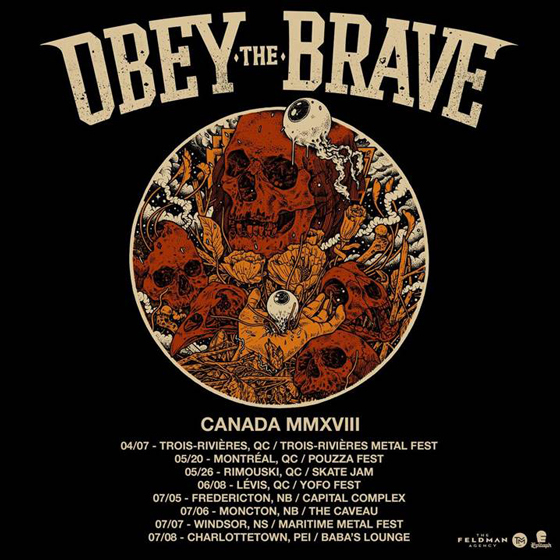 Nearly a year removed from delivering their Mad Season LP, Obey the Brave have mapped out a run of dates throughout spring and summer in Eastern Canada. The Montreal metalcore outfit will kick off the run at Trois-Rivières Metal Fest on April 7, followed by a pair of dates in Quebec at Montreal's Pouzza Fest (May 20) and Rimouski's Skate Jam (May 26). A date at Yofo Fest in Lévis, QC, on June 8 will give way to four dates in four nights around the Maritimes, with stops in Fredericton, Moncton, Windsor and Charlottetown. Find a complete tour itinerary below.